Every time I make this salad, I watch others polish off the dregs — the lemon-laced fennel, the toasty bits of almond — from the salad bowl. Make this fetching, bright-tasting salad in the winter months when tangerines are plentiful. Remove the stalks from the fennel bulb and cut the bulb into thin slices. Remove the fennel fronds from the stalks and roughly chop the fronds; discard the stalks. Place the fennel slices and fronds in a large bowl along with the sliced shallots, lemon juice, olive oil, salt and pepper; toss and set aside. Peel the satsumas and break them apart into quarters, then slice across the quarters, making triangles. Add the tangerines to the fennel, along with any accumulated tangerine juice. In a hot cast-iron or nonstick skillet, toast the almonds, shaking or stirring often, until golden brown. Remove from the pan to cool. 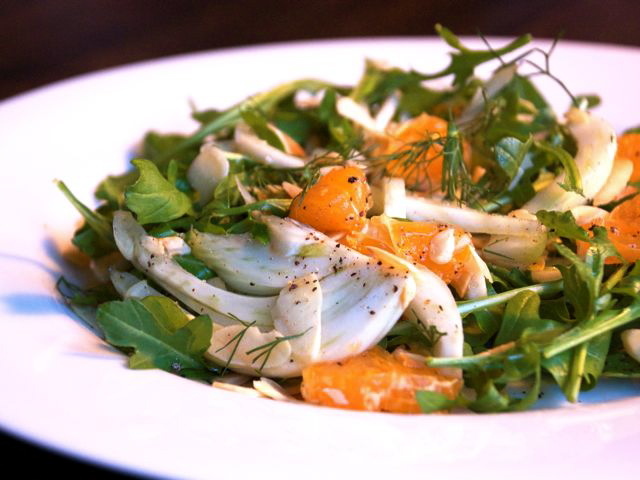 Add the arugula to salad bowl and toss with the fennel, tangerines, and half of the toasted almonds. Sprinkle the remaining almonds over the top of the salad, add a fresh grind of black pepper, and serve.